Or how I learned to stop worrying and love the Old Ones. Pandemic is a staple of cooperative board games. It’s often used as a starter game, driving new hobbyists deeper into this wonderful obsession. The reimagined Pandemic: Reign of Cthulhu, dripping with H.P. Lovecraft theming, is even more accessible than the original and a fresh take that will make Pandemic feel new again. You are an investigator, tasked with the all-important duty of sealing gates to another world and preventing Cthulhu from awakening. No pressure. You and up to three friends embark on this journey into Arkham with the odds stacked against you – towns are being overrun by zealots eager to bring the end of the world, Shoggoth roam, spreading madness, and all of Cthulhu’s buddies are waking up from a long slumber to make your job even more difficult. You must travel across four different towns, chasing off cultists and closing a quartet of gates. To close a gate, you must play five cards that match the town the gate is in. Close all four gates before Cthulhu awakens and you win. If only it were so easy. For one thing, there are a very limited number of cultist figures. Once you run out, you lose. There are also Shoggoth – monstrosities that require three of your four actions to defeat. And there are only three of them in total, so if you ever have to draw a fourth, you lose. The Shoggoth also move towards the nearest open gate. If they get through, they immediately cause an awakening. Awakenings are the key way to measure the approach of you-know-whom. At the start of the game, you place cards representing seven Ancient Ones face down, with the final card being Cthulhu. When an awakening happens, you turn over an Ancient One who causes either an instant effect (always bad for you) or a permanent status change that sticks for the rest of the game. As more awaken, the difficulty rises. These ancient fat cats can’t be dispelled, so you’re in for some real trouble if you don’t hurry to close those gates. You’ll also find four Evil Stirs cards in the player deck. Draw one and an awakening happens. So, yeah, Ancient Ones always be awakening in this game. While it might sound challenging, Reign of Cthulhu simplifies the core of Pandemic. In regular Pandemic, you would need to not only be at the same city with another player to trade them a card, but you’d need to have the actual card for the city you were on. In Reign of Cthulhu, cards only list the full town (there are only four of ‘em) and not specific locations, making giving and taking cards easier. The same goes for fast traveling. Here, you do so at bus stops, but instead of a specific location, you just have to play a generic town card. Easier to manage, for sure. That simplicity allows for a greater focus on theme, which shines. Rarely do the nutjobs who want to bring about the end of the world get any attention in Cthulhu-themed games. But they are the real menace and problem in the new Pandemic. True to Lovecraft’s work, there’s a prevelance of madness. Yes, you can go insane by meeting up with Shoggoths and from other game effects. And if you go nuts, you flip your character card over, limiting your number of actions and altering your role’s special ability. The changes are just enough to make Pandemic: Reign of Cthulhu feel like its own game. It’s familiar, but not so similar that you can get away playing without reading through the rulebook. 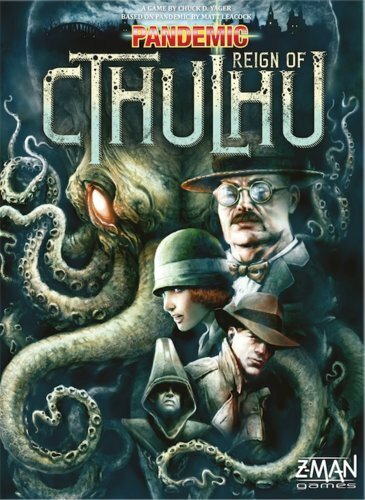 Is that enough to make Reign of Cthulhu a new mainstay for co-op games? Probably not. The theme is great, but the game feels more shallow than regular Pandemic. And it’s hard to imagine this being a game people play consistently for years going forward. It serves as a nice respite, but not a replacement to the classic. Awakening of Old Ones is a nice twist on classic Pandemic. Great use of an overused theme. Going insane is bad, but also kind of fun. Simplification of Pandemic rules wasn’t really necessary. Doesn’t seem to have a good way to scale difficulty. Spaces on board are too small for multiple figures. You are bored with traditional Pandemic, but still love the gameplay. You’re looking for a new, light co-op game. You feel a civic duty to preventing the awakening of Cthulhu. Dog and Thimble is a blog, podcast, and YouTube channel about board games. For all your board game news, reviews, and opinions, be sure to check out dogandthimble.com.